At the other end of the bookend is a visit from President Obama, with the expectation that good news will be available about the growing maturity and stability of the Irish peace process. One of its main uses outside Ireland has been to support processes such as the Middle East peace process and to get Palestinians to reduce their expectations about the future. Let there be no confusion. In Ireland itself, despite the absence of any formal opposition outside the small republican milieu and the far right of loyalism, the current settlement is in trouble and its imperialist sponsors are moving in with first aid. The fact is that the recent flag demonstrations have undone years of public relations work aimed at industrialists and the tourist industry and seen claims of impartial policing and a neutral democratic state exposed as false. It is in this light that the space between the bookends, the latest initiative from First Minister Robinson and Deputy First Minister McGuinness, must be examined. Despite attempts to talk them up, the new measures were met with disappointment, seen as timid steps that avoided the central problems. Criticism, even from the other capitalist parties supporting the peace process, was so harsh that it provoked a tirade of abuse from the dour First Minister. In actual fact the situation is far worse than it appears. These emperors have no clothes. The steps announced are not attempts to counter sectarianism but a mixture of hot air and measures that accommodate sectarianism. The more contentious issues are kicked into the long grass, with very clear signs that Sinn Fein will once again capitulate to Loyalism and move the goalposts further to the right. 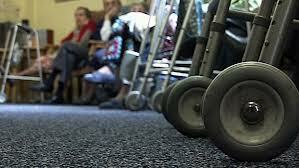 The news of the proposed closure of residential care homes across the North has led to political chaos. Health minister Edwin Poots has been under attack from the public, from the relatives of the elderly people affected, from Sinn Fein and from his fellow DUP MLAs. The first and deputy first minister have issued a public statement condemning the handling of the issue and, by implication, Poots. Poots himself, in a manoeuvre typical of the Stormont Circus, has distanced himself from the issue, claiming that no decisions have been made and a simple consultation exercise has been botched by his underlings in the Boards. He is contradicted by the facts. Ten of the thirteen Belfast homes have been closed. Private firms are already discussing with government the latest tranche of closures. Free State taoiseach Enda Kenny’s reaction to the public sector workers’ rejection of Croke Park 2 has been to declare that workers in this sector, by their vote, have stripped themselves of protection from redundancies. In effect, on April 24 he was saying that public sector workers, no matter how they voted or how the bulk of people in the 26-counties see things, had to accept either pay cuts or redundancies. Welcome to all capitalism has on offer to workers in Ireland, either side of the British state’s border. Meanwhile the latest Red C / Sunday Business Post poll, the results of which appeared in last Sunday’s SBP (April 28), indicate that less than a third (30%) of respondents support cuts to public sector pay, while 56% of respondents said the government should accept the position of the unions following their rejection of Croke Park 2. Just over two-thirds of people also thought that if there was any spare funds in the system these should be used to reduce taxes on working people. The interview below with Liam Sutcliffe, an IRA activist in the 1950s and 1960s and a leading figure in Saor Eire, was conducted and filmed by irish revolution contributor Mick Healy; Bas Ó Curraoin did the editing and added photos and music. There’s a point in the interview about Liam Walsh’s death and whether it was 1970 or 1971; it was in October, 1970 (he died in a premature explosion). We’ve also been working on doing an interview with Frank Keane, who was O/C Dublin Brigade during part of the 1960s and a founding leader of Saor Eire. There were several noteworthy features of Gerry Adams’ appearance on Prime Time on Monday night. Miriam O’Callaghan seemed somewhat out of her depth with a very in-form Adams. It was interesting, however, that she agreed that the nationalist population in the north had been on the receiving end of substantial violence. There was, after all, a time – a long time – when RTE simply ignored the repression of the nationalist community. Of course, it’s now safe for the official southern broadcaster to have its personnel agree that what the northern nationalist community was subjected to for so long was horrendous. Adams seemed more confident than he was a year or two back when under attack for his role in things like the disappearance and killing of Jean McConville. In fact, for much of the interview he appeared rather statesmanlike, putting O’Callaghan in her place, namely on the back foot. 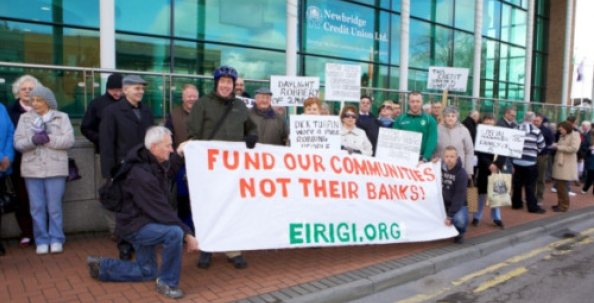 About 80 angry members of Newbridge Credit Union protested outside the office last Friday morning 26th April to demand a meeting with the Board of Directors and the special manager. People also protested against fees arising from the appointment of Luke Charleton. Charleton of Ernst & Young was appointed to run Newbridge Credit Union in January 2012. Since he was appointed to the Credit Union his fees have exceed 2 million Euro. Charletion will also receive an additional sum of almost 144,000 Euro to cover fees and expenses for 12 weeks to April 7th last. 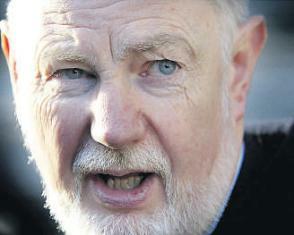 A local éirígí spokesperson said the sums are enormous from the point of view of a credit union with small depositors.